How do you know when you are about to hire the wrong real estate listing agent? It's simple. Ask a question related to the agent's ability to sell your home for more than it's worth. If the agent takes the bait, then he's the wrong agent to hire. Here's the sad thing about "how it works" when you interview real estate listing agents for the job of selling your home. They are trapped between what you need to hear and what you want to hear. Most home sellers love (or at least dearly like) their homes. They have lived an important segment of their life in the home, and they value the memories and events that transpired during their stay in the home. They subconsciously cannot help but see hidden values in the home that unfortunately will not be seen by others. Memories of a lifetime do not transfer with the home, yet homeowners often mistakenly allow these to "add value" when they go to sell the home. So a listing agent who gives an accurate valuation of a home is more likely than not, giving the home seller a lower value than the seller thinks the home is worth. And the majority of homeowners hire the first agent that says "I can sell your home at YOUR price." In other words, they hire the first agent that tells them what they want to hear. Is this really the best way to hire an agent? Several years ago, I wrote an article called 3 Lies Most Used By Real Estate Listing Agents. You should review the article if you are getting ready to interview Realtors to be your listing agent. Prior to the interview, make a list of what you are trying to discover in the interview. Here's an interesting question ... "Do you really care what the agent says your home is worth?" Think about it. You are interviewing the agent to see if she or he is the person who has the best ability to sell your home and achieve your goals. Are you needing every penny? Do you need to move by a certain date? Are there terms you need that are not usual and customary? You see, the ability of the real estate agent and the agent's company to achieve your goals should be the topic of conversation. 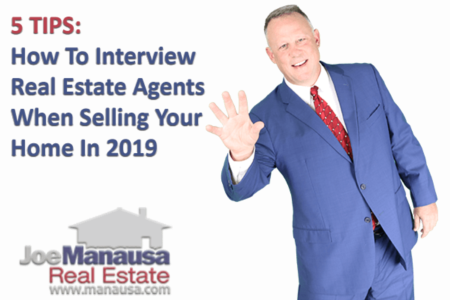 Once you decide you have the right agent (I highly recommend you interview several agents for the job of selling your home), hire the agent without discussing your home's value. By doing it this way, you will know you have not pressured the agent to lie to you and then you can set the price on the home based upon his or her expert recommendations. When you talk specific valuation with an agent prior to hiring, you are putting yourself in a position of liability. You cannot help but like the agents that "likes" your home the most (and saying they can sell it at a price higher than everybody else makes them very likable). It might be nice to hear a real estate listing agent say he "believes in your home" or "thinks your home is special," but those words or phrases should serve as a warning that you are likely being "sold." I have brokered thousands of home sales, and I believe in homeowners, not their homes. If a homeowner takes the time to understand how homes are sold today on the internet (94% of buyers are using the internet during the home-buying process), then they are likely going to use a home selling process designed to get them the most money for their home. Pricing high and then lowering the price over and over again has proven to cost home sellers money. Yet this is the method that must be used when you hire somebody who says they can sell your home for more than it is worth. Remember, do not talk specific value until after you have made the decision to hire the agent that can demonstrate dominance on the internet; somebody who can clearly show you the market liquidity for your home and how their home selling plan will get you top dollar for your home. Once you have interviewed several agents, one will stand-out as having the best process for bringing multiple buyers to your home. This is the one to hire, and it will be this one that you should listen-to when it comes to selecting the initial asking price for your home. 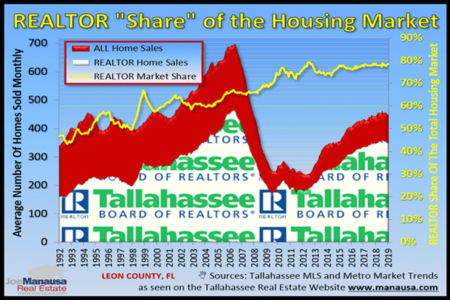 If you plan on selling a home in Tallahassee, then we would like to be one of those agents that you interview. Our comprehensive home-selling plan will show you how we will get you top dollar when it comes time to sell. So if you are thinking of putting your home on the market within the next six months or so, simply make contact with us here and we'll set-up a time to show you what you need to know.